Are you ready to be an internationally recognized spiritual speaker? ACCEPTING ENTRIES NOW — This is your chance to have YOUR voice be heard. For the first time ever, the world renowned Celebrate Your Life conference is offering you the chance to WIN a speaking slot at CYL in November of 2018 in Phoenix, Arizona. This is your opportunity to put yourself in front of leading producers, New York Times best selling authors and successful agents in the personal development and spiritual genre. Each entry will be reviewed by a panel of judges. These carefully selected judges are seasoned professionals in the spiritual and personal development arena. The judges will award one individual a 2 hour speaking slot at Celebrate Your Life in Phoenix, Arizona on November 2-5, 2018. Rodney has been managing Iyanla Vanzant’s career for over 10 years along with many other high profile clients. Gregg is an internationally recognized best selling spiritual author and travels all over the world speaking to audiences about science and spiritually for over 25 years. Prior to becoming the bestselling author of the Soulmate Secret, Arielle was the Public Relations manager to Dr. Wayne Dyer and Deepak Chopra. For the past 20 years, Rita has been an agent to several high profile spiritual authors including Neale Donald Walsch, Gregg Braden, James Redfield and more. Having started her teaching career out of her living room, Sunny currently speaks to audiences all over the world, is a best selling author and has created several product lines. Liz is the co-founder and CEO of Mishka Productions and Celebrate Your Life events. She has been producing spiritual events for over 22 years and has a keen eye on what it takes to be an effective presenter. Here's a heads up about some very popular programs coming to 1440 in 2018, so that you can book your seat now before it’s too late. APRIL 27 - 29, 2018 — Become a freedom fighter in your own life. 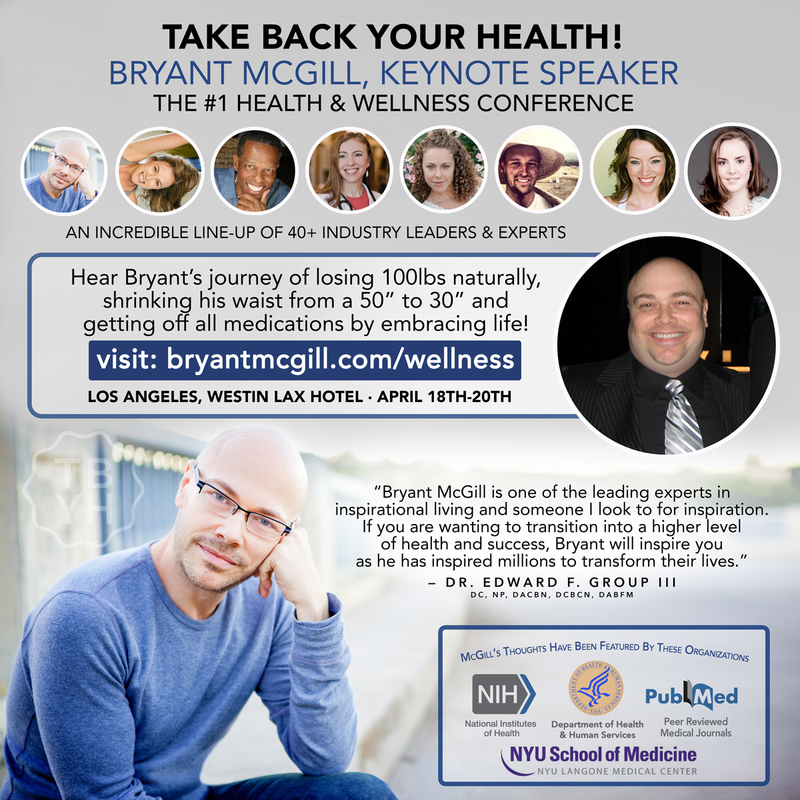 Join Bryant McGill, celebrated thought leader and human-potential pioneer, for a weekend of purpose and passion. Get ready to accept your unlimited inner strength and empower your unique mission on this planet — to be yourself. Overcome self-sabotage, let go approval-seeking insecurity, and awaken untapped leadership that the world desperately needs. What does it mean to be enough? What would it be like to once and for all let go of the people-pleasing and approval-seeking and to resist the story that being "good" is the only way to receive acceptance and affection? 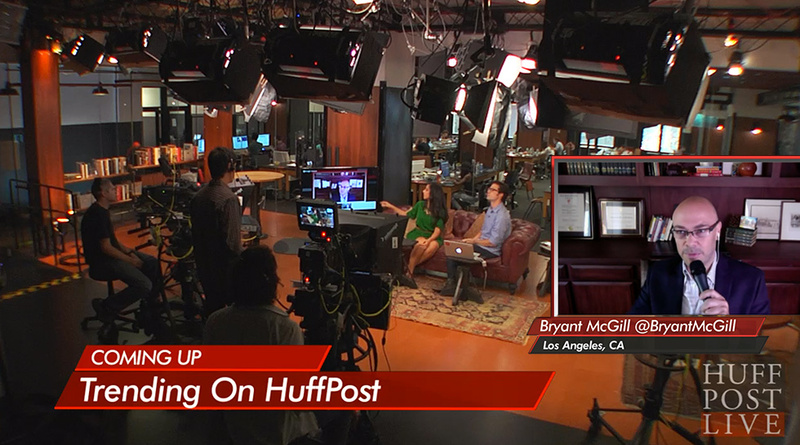 Join Bryant McGill, activist and human-potential pioneer, to become a freedom fighter in your own life. Accompanied by his "co-creating" partner, Jenni Young McGill, Bryant will guide you to a deeper possibility that you are not only enough, but that your unique journey, no matter how painful, has prepared you to receive and to give rare value that only you can give. Integrate your shadow, your darkness, and embrace your dualities so as to live in a "not-watered-down," full-spectrum spirituality and create lasting positive change in your daily life. This workshop is about accepting the mantle of your real power and calling, allowing your delicate transcendental beauty and your ferocious inner steel to come together and empower your unique mission on this planet — to be yourself. It is also an opportunity to take inventory of your hidden strengths, learn new skills, and build them into leadership the world so desperately needs. 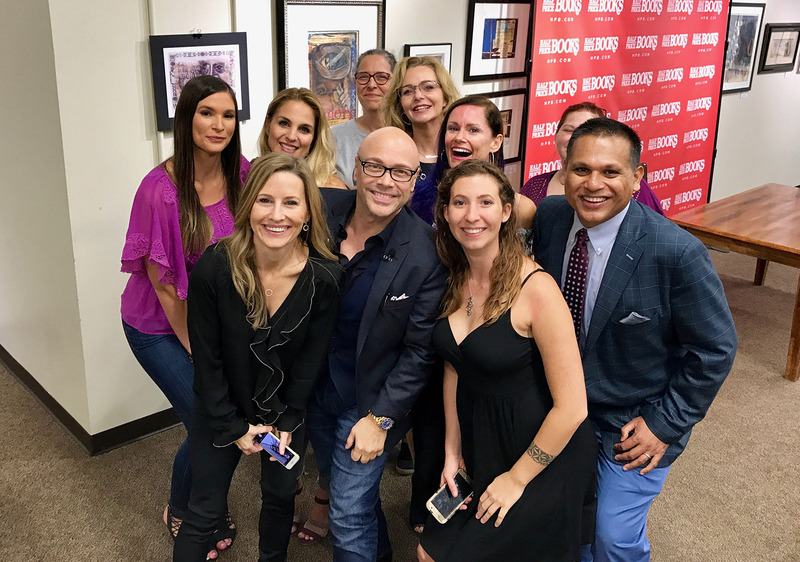 Bryant McGill named a "Health Hero" and speaks in Houston at Emmy-winning TV star and medical doctor, Dr. Partha Nandi's best-selling book tour for his book "Ask Dr. Nandi, five steps to becoming your own Health Hero for Longevity, Wellness and a Joyful Life. Partha Nandi, M.D., is the celebrated star of the award-winning TV show, Ask Dr. Nandi, which reaches over eighty-five million US households, empowers readers to become their own health hero. Ask Dr. Nandi is a medical lifestyle show of the highest quality, whose mission is to improve the health of America and the world with compassion, empathy and integrity. 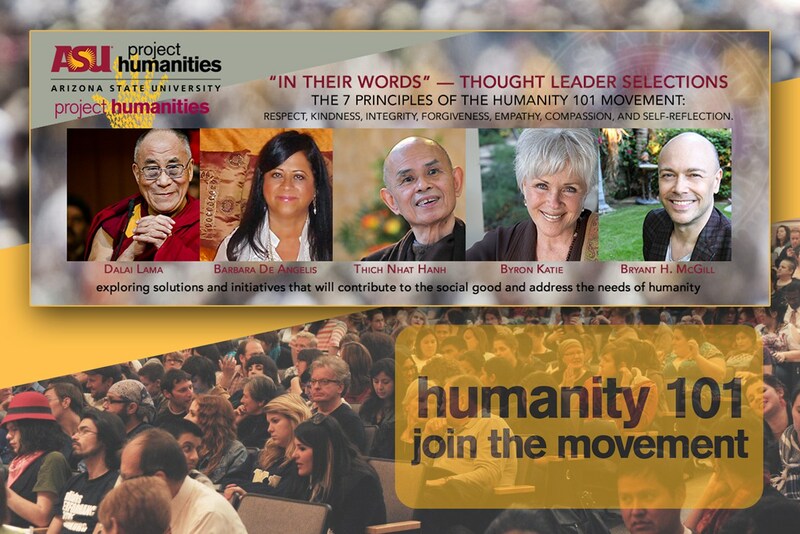 McGill included as one of Forbes Magazine featured cultural thought leader, regarding, "Thoughts on Conflict" alongside authors, cultural critics, and social change makers, George Sanders, Thomas Paine, Aristophanes, Robert G. Ingersoll Friedrich Nietzsche, Terry Goodkind, George R.R Martin, B.C. Forbes, Eric Hoffer, and Ayn Rand. Honored to speak and share my ideas, and learn from delegates from over 50 countries in a beautiful and productive forum of diverse international cultural goodwill. 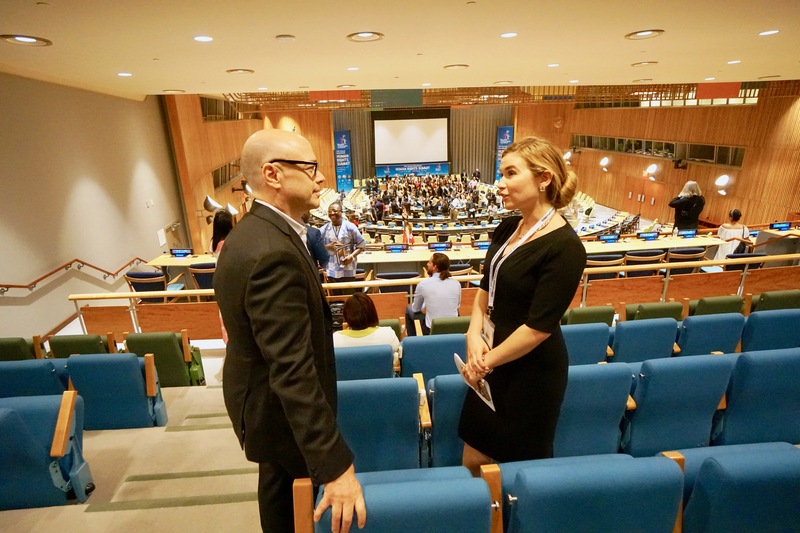 Among the 360 people attending were ambassadors and other representatives of the permanent missions to the UN including Afghanistan, Bangladesh, Bahrain, Canada, Cuba, Cyprus, Equatorial Guinea, France, Ghana, Ireland, Italy, Mexico, Myanmar, Nepal, Pakistan, Panama, Romania, Sri Lanka, and Turkey. McGill Speaking at the United Nations — 14th International Youth Summit for Human Rights. Keynote by Nobel Laureate and former President of Costa Rica Dr. Oscar Arias Sánchez. Master of ceremonies Dr. Mary Shuttleworth, Founder and President of Youth for Human Rights International, introduced the panelists who addressed important aspects of the state of human rights and human rights education: Summit sponsor, Ambassador Laura Flores, Permanent Representative of Panama to the United Nations; co-sponsor Ambassador Ry Tuy, Permanent Mission of the Kingdom of Cambodia to the United Nations; Ambassador Mahmoud Saikal, Permanent Representative of the Islamic Republic of Afghanistan to the United Nations; Ambassador Michael Grant, Deputy Permanent Representative of Canada to the United Nations; and Nobel Laureate and former President of Costa Rica Dr. Oscar Arias Sánchez, Christopher Ahearn, Director of Partnerships of Reach the World; Bryant McGill, U.N. Women Global Champion, author, activist, and social entrepreneur; Kerri Kasem, radio and TV host, activist and founder of Kasem Cares. As the leading organization with a global mandate to promote gender equality, women's rights and women's empowerment, the United Nations Entity for Gender Equality and the Empowerment of Women (UN Women) calls for a specific commitment to achieving gender equality, women's rights and women's empowerment in the Sustainable Development Goals (SDGs), as well as robust mainstreaming of gender considerations across all parts of the framework. To make a difference, the new framework must be transformative, by addressing the structural impediments to gender equality and the achievement of women's rights. To address these systems of discrimination, and the institutionalization of women’s subordination that they create, the goal must seek to end violence against women and girls and provide services to victims; end histories of underinvestment in expanding women’s and girls’ capabilities and resources; and reverse the systematic marginalization of women from public and private decision-making. Celebrate Your Life in Scottsdale with Bryant McGill, Caroline Myss, Marianne Williamson, Neale Donald Walsch and more! Join Bryant along with Marianne Williamson, Gregg Braden, Caroline Myss and many other transformation speakers for a 3-day respite from the challenges of the world. You will find yourself surrounded by an amazing global community of soul seekers. Bryant McGill and Grant Cardone Teach Social Entrepreneurship Graduate Class at Nasdaq, Times Square. As a part of Nasdaq's ongoing mission to support emerging business leaders and to nurture entrepreneurship, we have a limited seating opportunity to new graduates and local business leaders, to attend the "Social Entrepreneurship Graduate Class" hosted at the Nasdaq MarketSite in Times Square and featuring thought leaders, Grant Cardone and Bryant McGill. This will be an intensive, interactive presentation and Q&A, to help you focus your critical next steps in the marketplace, and to give you rare creative insights and power strategies, from some of the top influencers in the fields of business, social media, marketing, and personal empowerment. Bryant McGill will be speaking on, "The Deep Use of Existing Technology" at the Small Business Festival, which is listed as Inc. Magazine's "Top 5 Must-Attend Conferences"
Enjoy unparalleled access to industry experts and speaking legends such as Brett Hurt, Bryant McGill, Jim Cathcart, Laurie Loew, Gary Hoover, Scott Finley, Courtney Clark, Jim Comer, Koy McDermott and more. 3 days of Premium Events at the Google Fiber Space in downtown Austin, and 5 days of FREE Community Events at WeWork, Tech Ranch, Orange Co-working, Capital Factory, Entrepreneur Center of Austin and more that will coincide with National Small Business Week May 1-7, 2016. Created to inspire and educate entrepreneurs and small business owners through keynote presentations, panel discussions and interactive workshops on topics crucial to help small businesses grow big. Learn from more than 70 speakers including CEO's, founders and business experts while networking and celebrating local successes with like-minded self-starters. Celebrate Your Life Unity Conference with Bryant McGill, Iyanla Vanzant, Michael Beckwith, Marianne Williamson, and more! 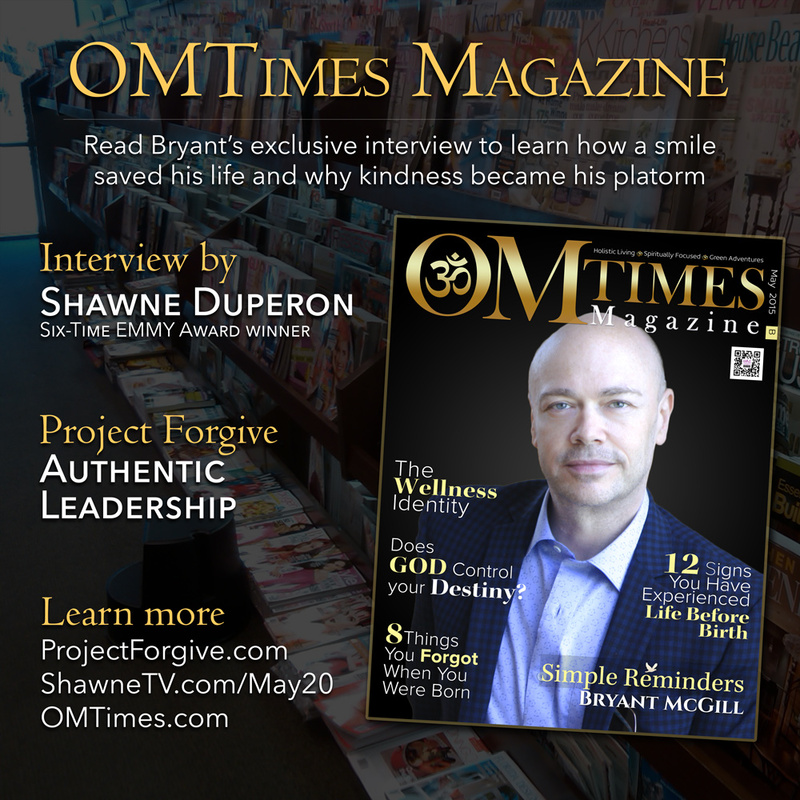 See Bryant McGill and Jenni Young, of Simple Reminders in person in Houston where Bryant is speaking with Marianne Williamson, Iyanla Vanzant, Anita Moorjani, Sunny Dawn Johnston, Gay Hendricks, Dr. Jean Houston, and Michael Beckwith. Join the world's top healers, thought-leaders and spiritual teachers as they share their unique and collective wisdom for the Soul-awakening event of the year. Discover connection, healing, growth and guidance on a whole new level as you explore the farthest corners of your soul and the highest realms of consciousness. Become a member of the loving community of like-minded seekers, believers and angels sent to support and accept you for being exactly who you are. Unlock your unique gifts and abilities as you step confidently into your destiny and realize your life purpose as you help raise the vibration of the whole world, one soul at a time. It's a supercharged masterclass, transformational workshop and summit all rolled into one! 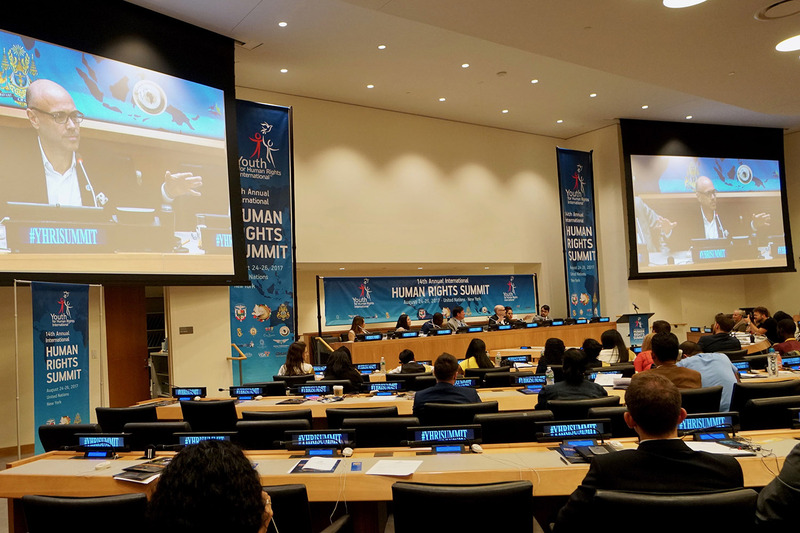 McGill spoke at the United Nations' General Assembly Hall on Human Rights Day about non-violent parenting, gender equality, and the structural violence in culture and society. The program, on Human Rights Day, was honoring Nobel Prize laureate, Malala Yousafzai at her film screening in cooperation with UN Women, the Malala Fund, and the Muslim American Leadership Alliance. 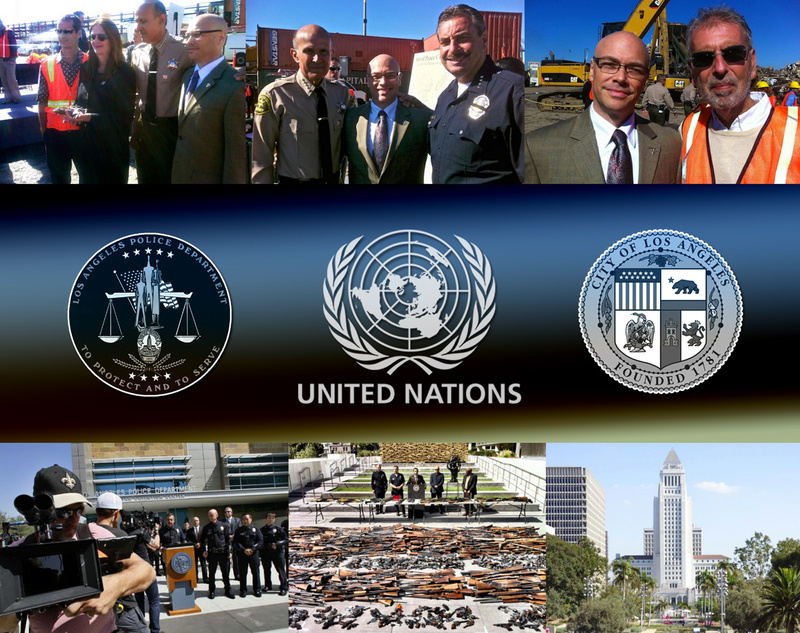 The event was held at the United Nations Headquarters, General Assembly Hall, in New York City. In 2015 McGill was appointed a United Nations Global Champion for the rights of women and girls, gender equality, and human rights. 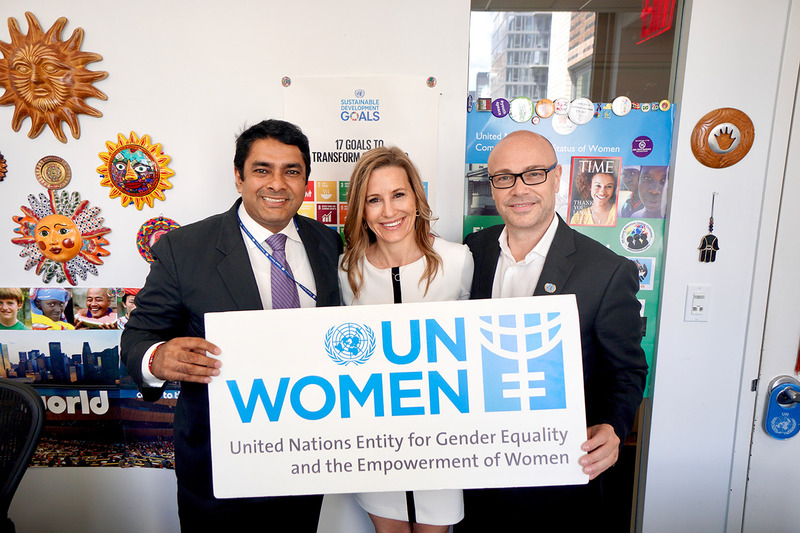 He was commissioned by the Executive Deputy Director of UN Women to the Planet50/50 and HeForShe initiatives, along with fellow programme leaders Aung San Suu Kyi, Emma Watson and Nicole Kidman. 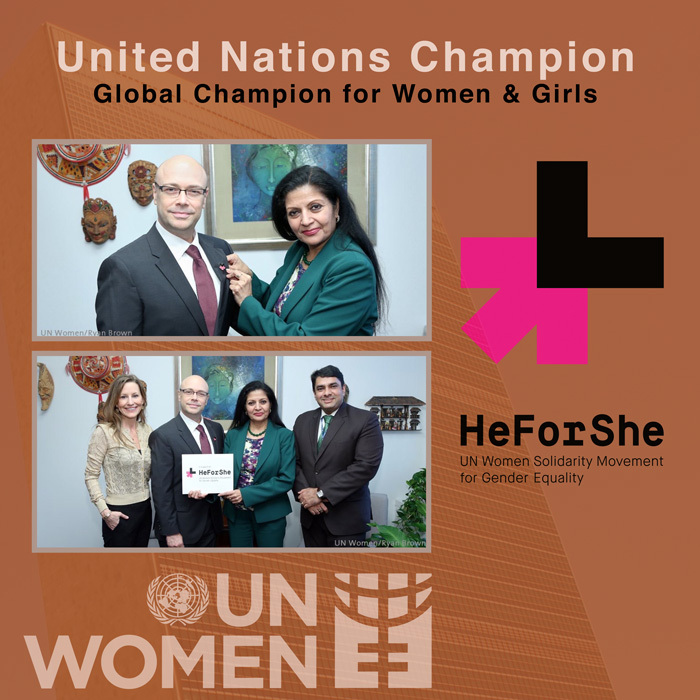 In the months following the kick-off of the initiatives, several Heads of State, along with other celebrities have committed to be champions for the HeForShe campaign. Ms. Watson said: "Everyone from Desmond Tutu to Prince Harry to Hillary Clinton and Yoko Ono has issued their support." 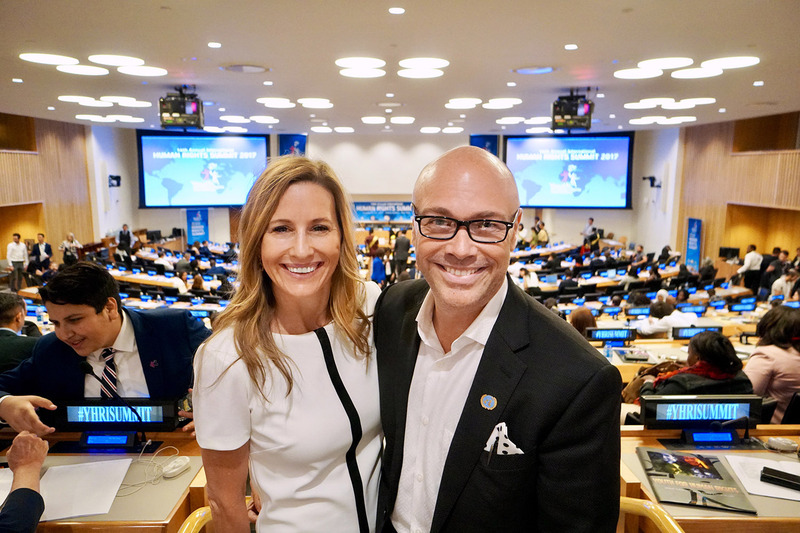 As an appointed Champion McGill will be involved in speaking and activism around the world at events, and with outreach through social media, as the U.N. strives to make equality a reality by 2030. 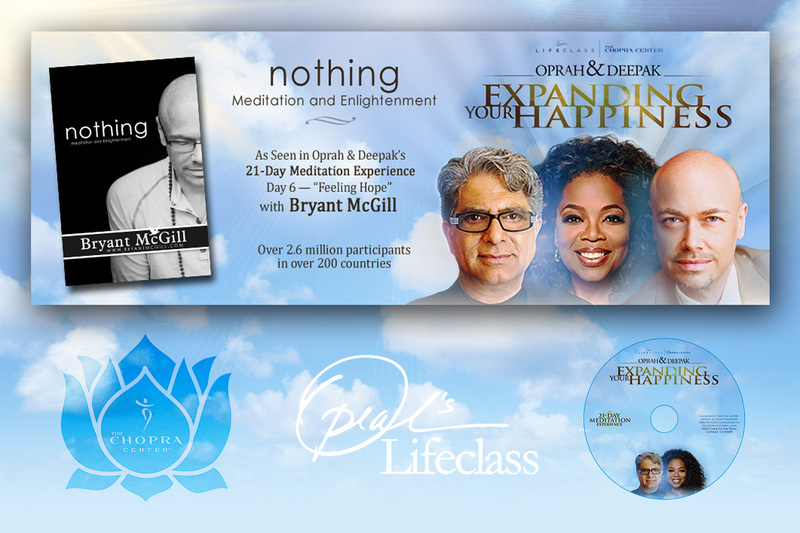 Join Bryant McGill, Dr. Shefali Tsabary, Neale Donald Walsch, Mallika Chopra and more in Long Beach, CA. Dear Community, Bryant McGill and Jenni Young, of Simple Reminders, will be in Long Beach, where Bryant will be presenting at this deeply empowering event with other speakers and thought-leaders. He will be discussing his transformation and healing from childhood struggles, and taking you on an intimate, personal journey, sharing how he healed his inner-child. Take this opportunity to get your tickets and book your stay while there is availability. 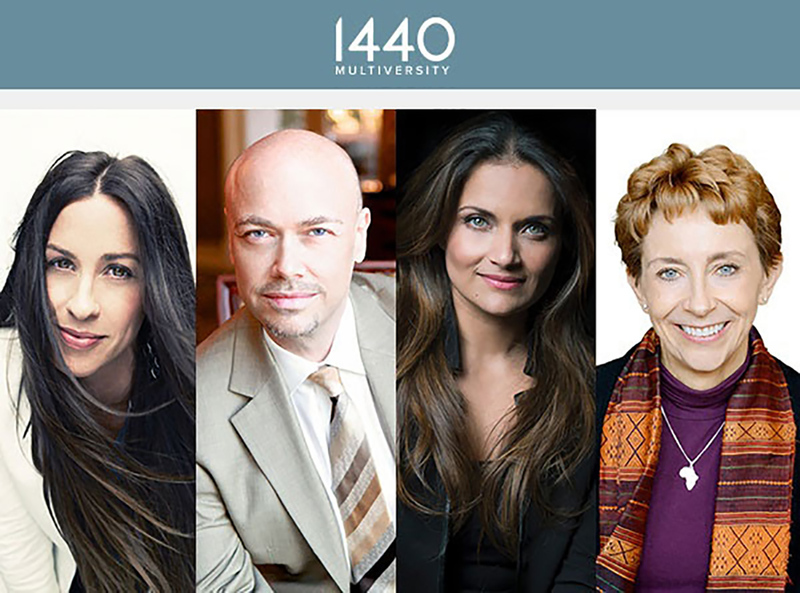 Speakers include: Dr. Shefali, Neale Donald Walsch, Mallika Chopra, Bryant McGill, Laurie Lankins Farley, Emily Filmore, Susan Stiffelman, Roma Khetarpal, Suzi Lula, Ellie Knaus, Bianca Kajlich, and more. I am honored to be included in these official university programs and publications which have received a commendation from the Dalai Lama. Having my ideas presented alongside eminent thought leaders to the university students regarding building a better world through basic values is a rewarding and humbling experience. Thank you to the faculty, editors and program directors for including me and my work. 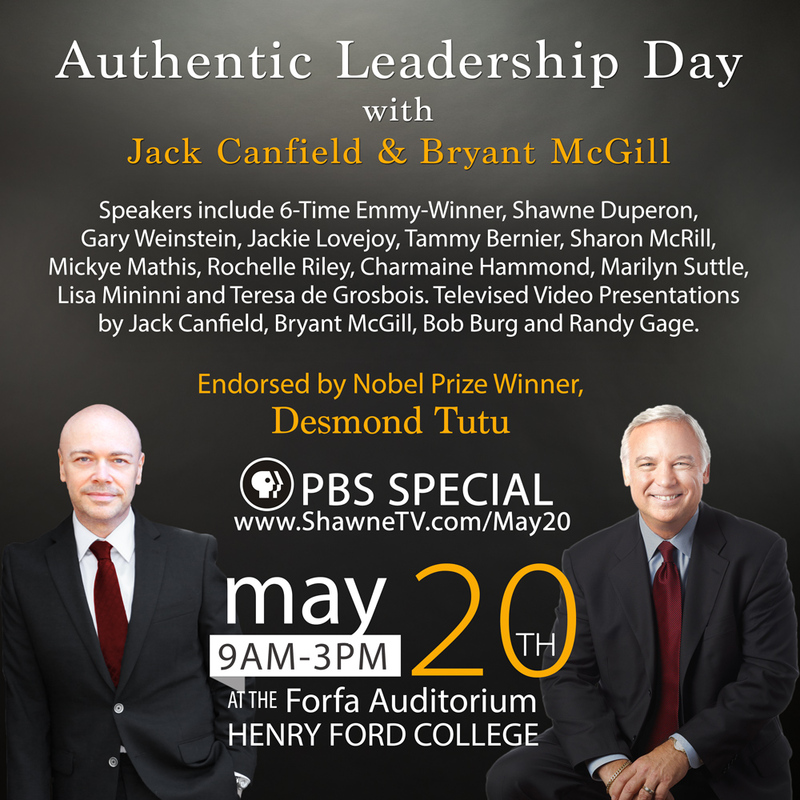 I am delighted to be presenting with Jack Canfield, Bob Burg, Randy Gage and other thought-leaders at the PBS televised leadership event, Authentic Leadership Day, supported and endorsed by Desmond Tutu and Naomi Judd, and held at the Henry Ford College, Forfa Auditorium. The event is produced by Six-Time EMMY winner, Shawne Duperon to benefit the charity, Project Forgive. Please join us there! Join me as I share all of my best information for how I transformed my life and how you can too! 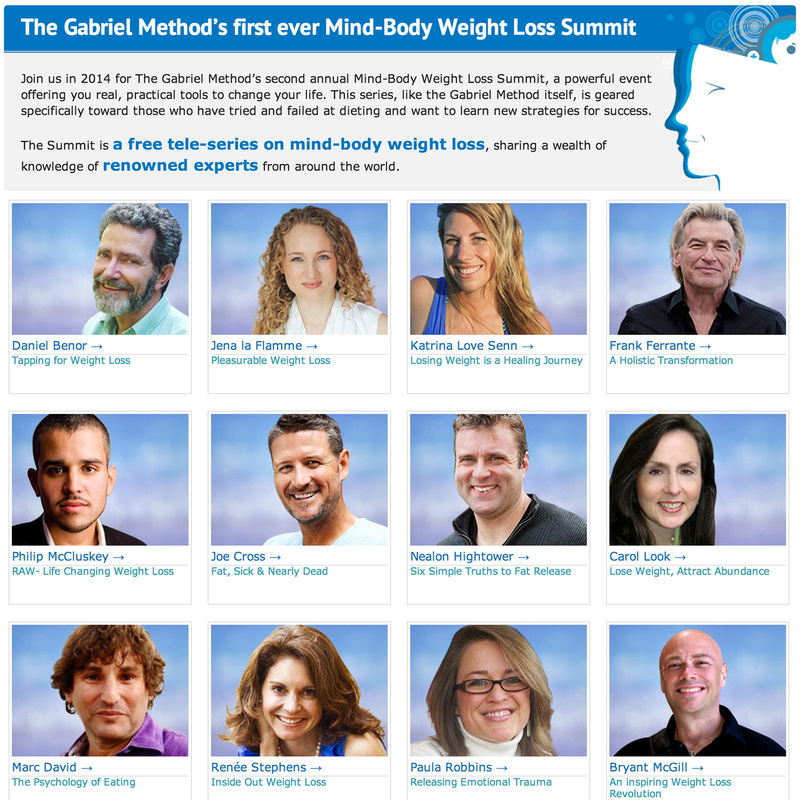 Also see 40+ health and wellness experts who will give you the best advice possible for reclaiming your life! True to our name, our speaker lineup and lectures provide information that is life-changing, with the ability to prevent and reverse disease when implemented into our lifestyles with purpose. Regardless of where you are on your journey to health, Take Back Your Health is an experience that takes you closer to your ultimate health goals — with new information, new friends and new perspectives. At Take Back Your Health, there are 5 stages, representing 5 pillars of optimal health. 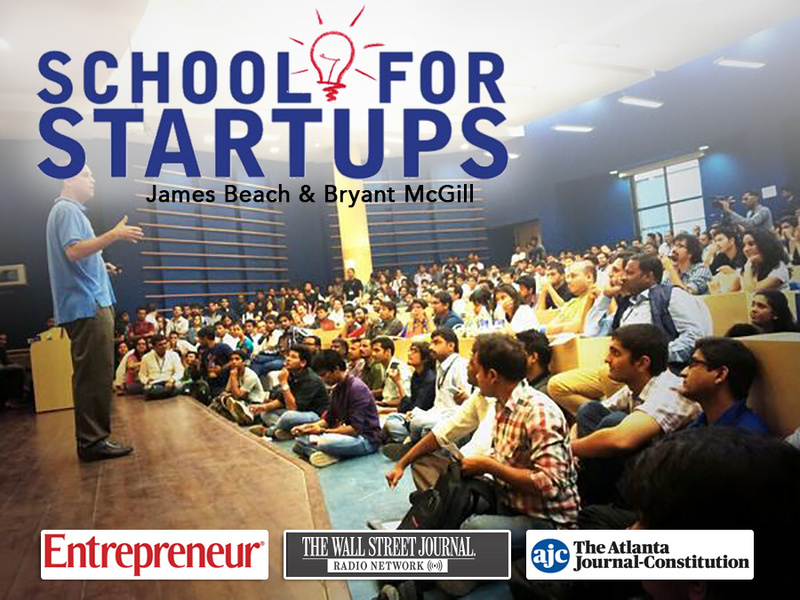 Join Bryant McGill and (Jim Beach)(http://schoolforstartupsradio.com/about-us/), the acclaimed educator and entrepreneur expert in a discussion about, overcoming obstacles, meritocracy, entrepreneurism and developing the mindset of success with compassion. Also hear Dr. Andy Fuehl; a leading wealth expert teaching people how to achieve success and become millionaires doing work they love. Andy teaches people to think like a successful entrepreneur, even at your job. No matter your profession, you must think and act like an entrepreneur. Andy has taught thousands of people just like you his proven strategies to succeed quickly and easily and to Take Action Now. His best selling book, Wealth Without a Job: The Entrepreneur's Guide to Freedom and Security Beyond the 9 to 5 Lifestyle, tells his story of going from being unemployed to millionaire in under three years! He is also the author of several other books and worked with Nightingale Conant, the largest audio self-help publisher in the world. If you were one of the 20 million people who heard Bryant on SiriusXM and signed-up to come see Bryant presenting on-stage in Indianapolis at this event, we apologize for any inconvenience. 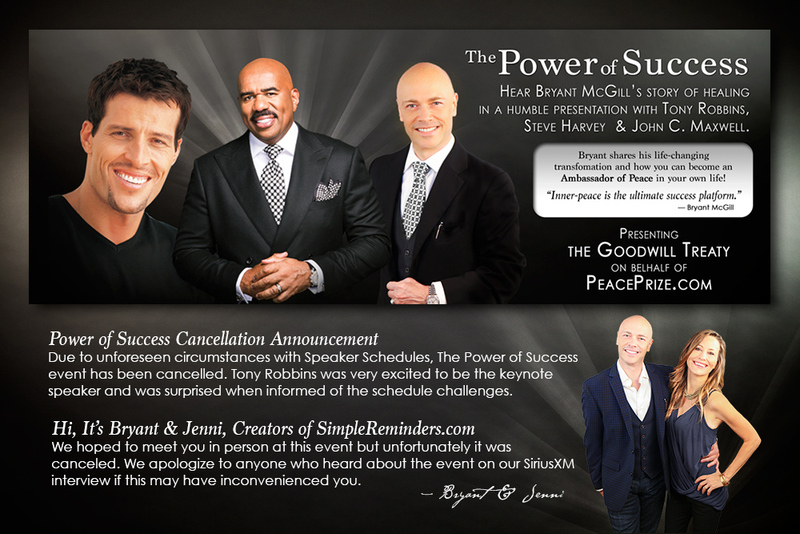 Bryant, Tony Robbins and other presenters were surprised to hear about the cancellation and the event producers have processed all refunds. July 5th is going to be a magical night! The event will feature an opening performance by Charlo Crossley Fortier and the New Directions Female Veterans Color Guard. 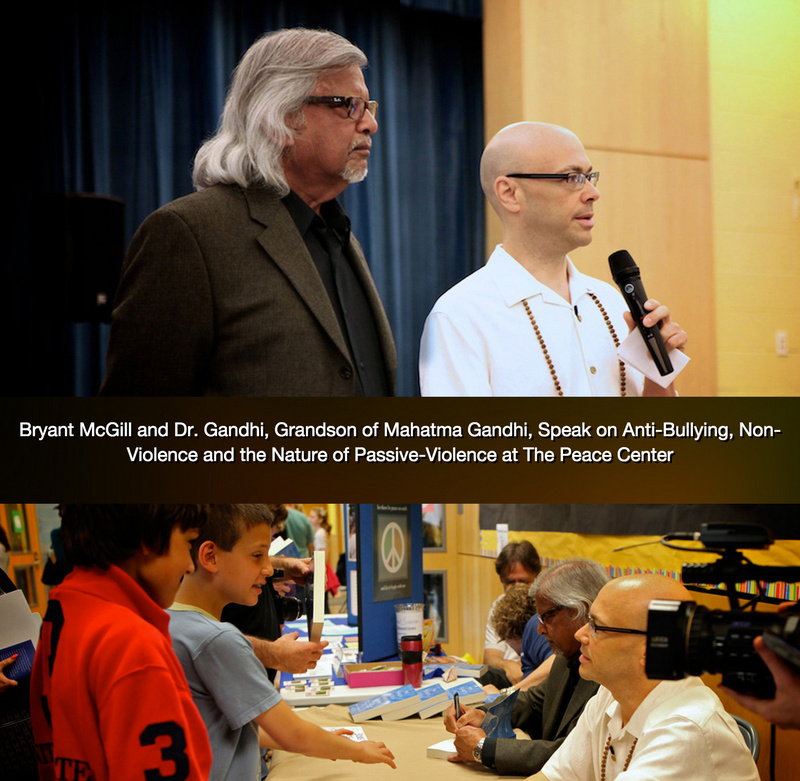 Closing the show will be a peace treaty presentation and discussion about the power of music for peace by Susaye and Bryant McGill, the acclaimed author, speaker and goodwill ambassador. The mission of this show is to celebrate the re-release of Scherrie and Susaye's highly-acclaimed 1979 Motown album "Partners" and to support local health and youth initiatives. Come celebrate with us. Log on to www.supremepartnerslive.com to stay up to date on what's to come. — with Bryant McGill, Tyrone DuBose, Annetta Bryant, Donni Haas, Sydney Colston, Charlo Crossley Fortier, Scherrie Payne and Susaye Greene. Emmy, Grammy and Oscar winners in attendance. Will be a blast! Bryant McGill is giving away 500 autographed books to attendees. Even if you don't buy a ticket, stop by and meet Bryant and Jenni in person and get a FREE COPY of his highly-acclaimed bestselling book, Voice of Reason. 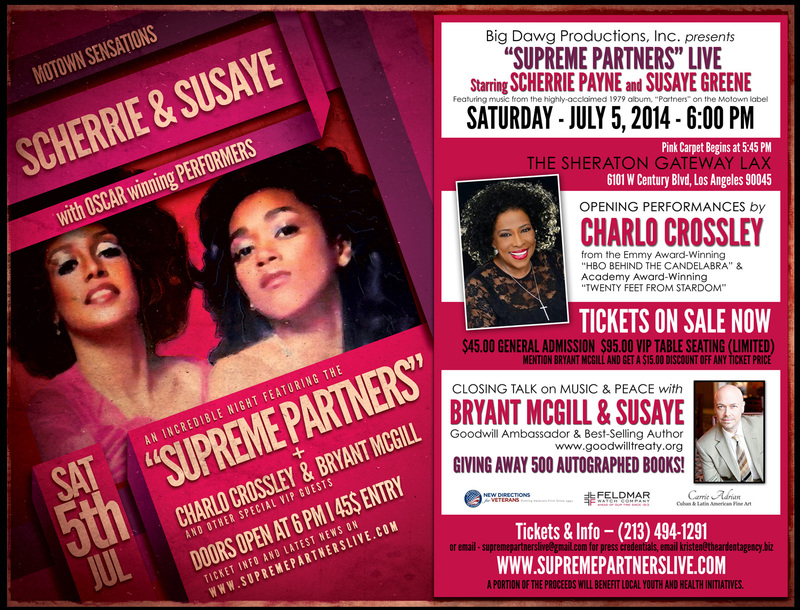 You are warmly invite you to join Bryant McGill and Jenni Young at "Supreme Partners" LIVE, a benefit concert starring to Scherrie Payne and Susaye Greene, the last two official members formerly of the legendary group, The Supremes. The event will be held on Saturday, July 5, 2014 at The Sheraton Gateway LAX Hotel (6101 W Century Blvd, Los Angeles, CA 90045) from 6:00 pm to 9:00pm with red carpet arrivals at 5:45 p.m.
Join Bryant on The Shaun Proulx Show, which is the most-heard LGBT radio show in the country. Called "a visionary entrepreneur" by The Toronto Star and "The Canadian Ellen." 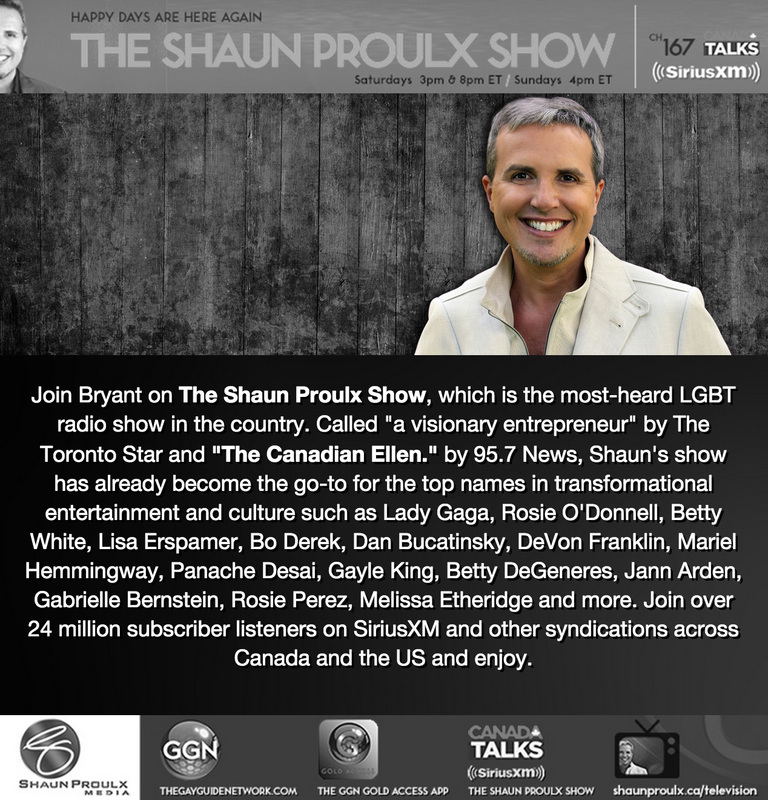 by 95.7 News, Shaun's show has already become the go-to for the top names in transformational entertainment and culture such as Lady Gaga, Rosie O'Donnell, Betty White, Lisa Erspamer, Bo Derek, Dan Bucatinsky, DeVon Franklin, Mariel Hemmingway, Panache Desai, Gayle King, Betty DeGeneres, Jann Arden, Gabrielle Bernstein, Rosie Perez, Melissa Etheridge and more. 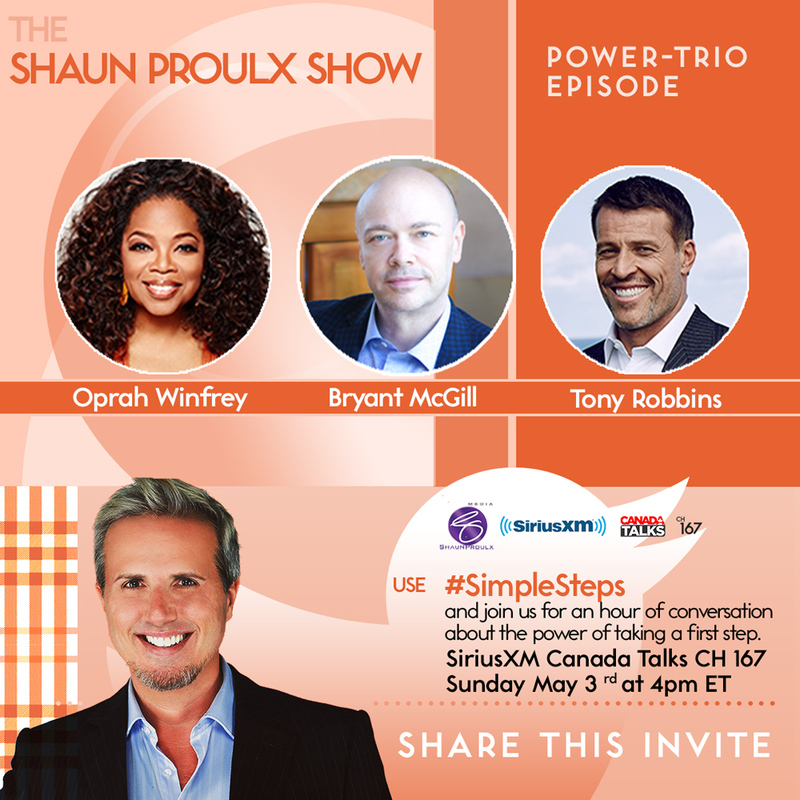 Join over 24 million subscriber listeners on SiriusXM and other syndications across Canada and the US and enjoy. 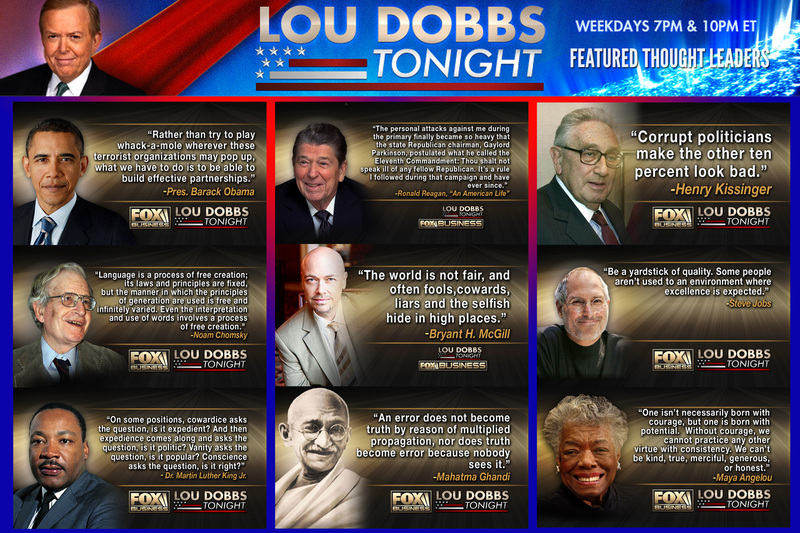 So humbled and grateful to be a featured thought leader on Fox's Lou Dobbs show alongside Barack Obama, Ronald Reagan, Henry Kissinger, Noam Chomsky, Steve Jobs, Martin Luther King, Jr., Mahatma Ghandi, Maya Angelou, et al. 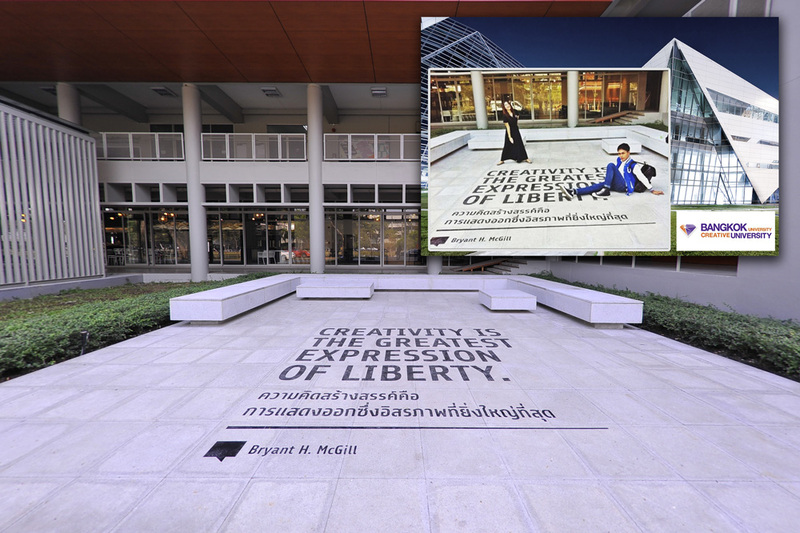 In 2013, Bryant McGill's writings on creativity and freedom were used as part of a campus installation at the renowned Bangkok University. Panadda Unyapho, Ph.D., Director, International Affairs gave Bryant the good news that his words are being used to inspire students as part of their celebration of 50 Years of Creativity. Bangkok University is internationally renowned for its theme of creativity. Bangkok University serves 29,000 students and is known for its stunning architecture and cutting-edge art, design and media programs. "Creativity is the greatest expression of liberty." Learn from the world's most successful professional athletes, fitness gurus, and athletic entrepreneurs the strategies you need to find balance and excel on and off the race course. I'm delighted to join this panel that includes World Champion athletes, a 6 time Ironman World Champion and First Inductee to the Ironman Hall of Fame, a blockbuster Hollywood movie producer, award winning fitness bloggers, and multiple millionaire CEOs and entrepreneurs. ALL of them eager to share the secrets of how they stay motivated, focused, and on track for success. 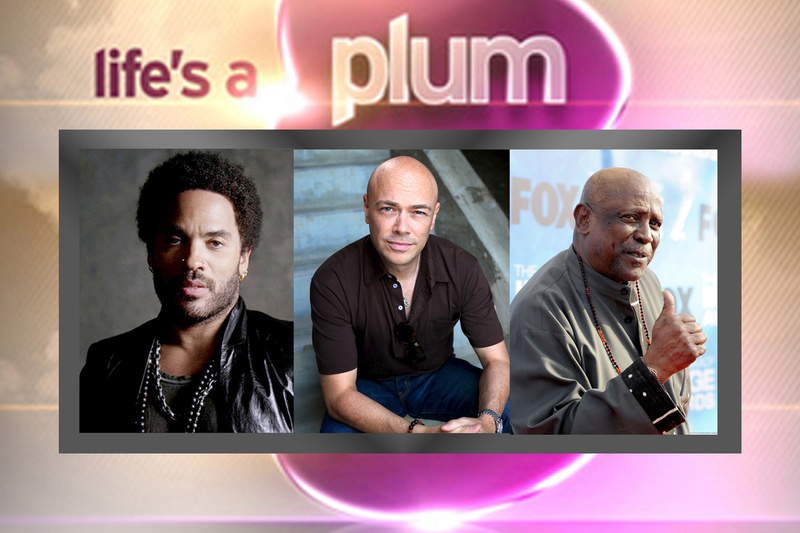 Honored to appear as a World Charity Day Spokesman in a 12 month televised cycle of public service announcements for charities on Plum TV with Lou Gossett, Jr., Lenny Kravitz and singer Chayanne. Airing in Aspen, Nantucket, the Hamptons, Martha's Vineyard, Telluride, Sun Valley, Vail, and Miami Beach.